American Graphics has been serving Marines around the world since 1992. We are a Marine Veteran Company, and take great pride in serving our great Corps in and out of the uniform. We have the inside track to help our fellow Marines with all of the extra stuff you have to do such as; raising money for the Ball Fund, Unit T-shirts, Recruiting, T4T's, Coffee/Mess Funds, Challenge Coins, Marine Mud Runs, and more. Yes, with all of us combined we have done it all in the fleet and special duty. By calling us, you have just saved yourself, time and money. If you don't see anything that pertains to your misson just give us a call, we have a large database of products that can fit your needs. Wounded Warrior Fund, Toys for Tots, Marine Corps League, Marine Corps Heritage Foundation, The National D-Day Memorial. Boy Scouts of America, VFW, and the DAV. Mike Sheperd, Commandant of the Roanoke, Virginia, Marine Corps League. 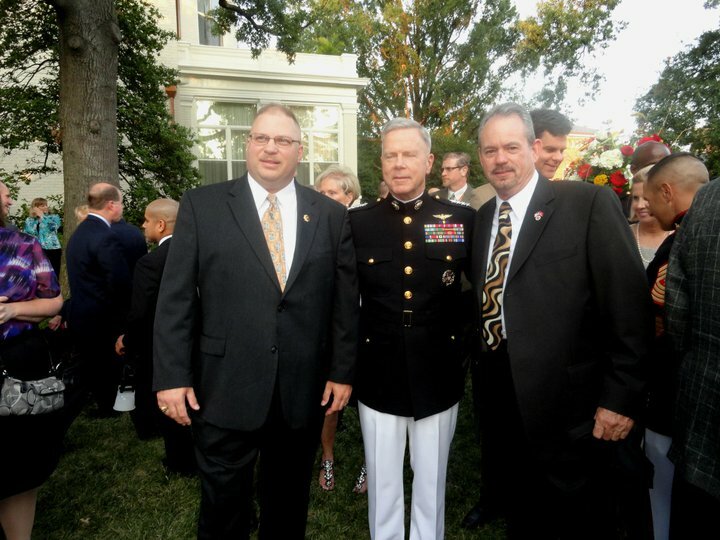 Thank you SgtMaj of the Marine Corps for your invite to the Commandant's house and to see the evening parade.